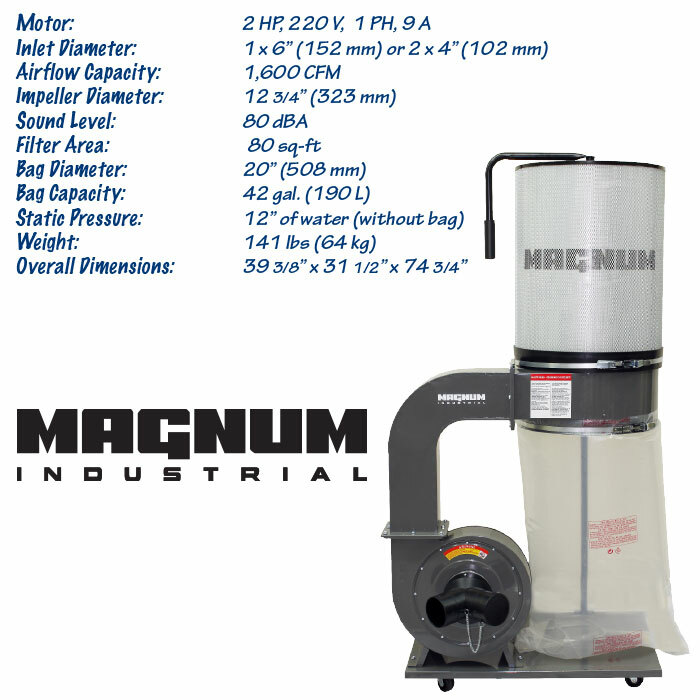 With the arrival of our new Magnum Industrial dust collectors, we thought that it would be a good time to review the basics of choosing and setting up a dust collection system. 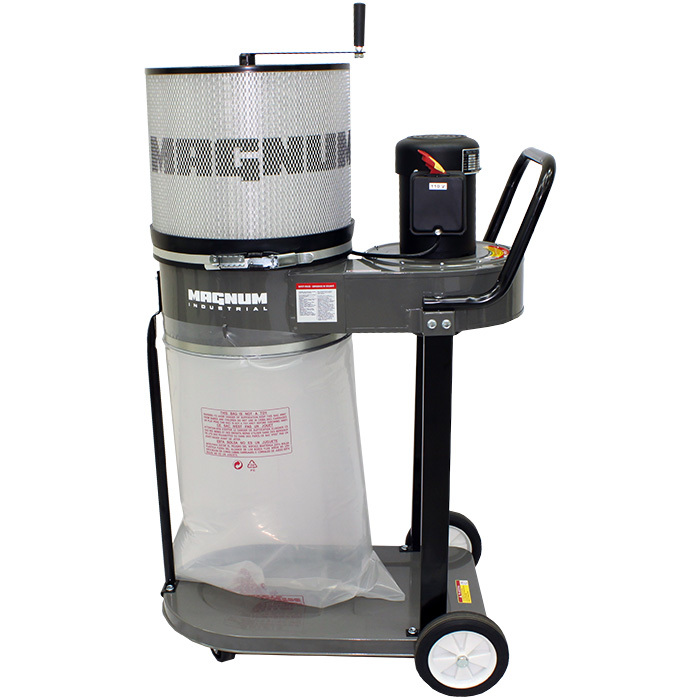 An effective dust collection system is an important component of every clean and safe woodworking shop. To make this happen, you need to plan ahead, carefully review your dust collection needs and choose the equipment that suits your shop. For some woodworkers, a dust extractor will meet their needs. Dust extractors are powerful and portable, and they provide point-of-origin dust collection for mitre saws, jobsite table saws, track saws, sanders and grinders equipped with the appropriate vacuum shroud. Unlike a shop vac, dust collectors are designed to move fine particles. 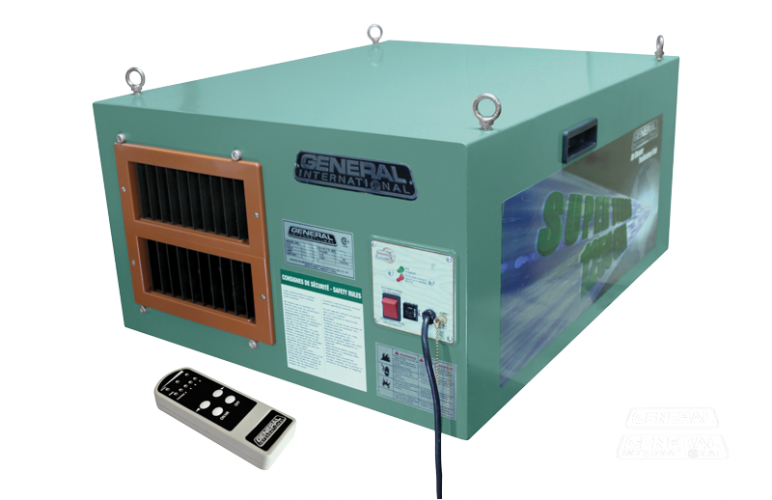 Many have HEPA filters, anti-static hoses and tool-activated power switches. If you use a table saw or disc sander, which can require up to 400 and 450 CFM respectively, you’ve already outgrown your dust extractor. But small shops don’t necessarily need big dust collectors. 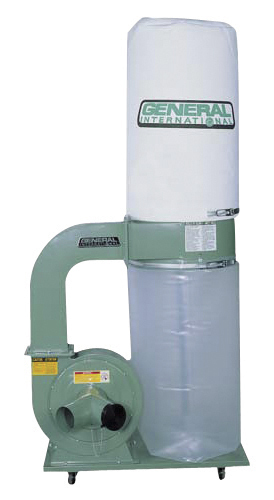 KMS sells a variety of 3/4 and 1 HP portable dust collectors that pull between 450 and 700 CFM and can connect directly to your machine. If you have a large shop (or plan to expand), operate two or more pieces of machinery at the same time or want to avoid disrupting your workflow with moving and connecting a small dust collector, choose a larger collector (1 1/2 HP or higher) and install ductwork that fits your shop and workflow. 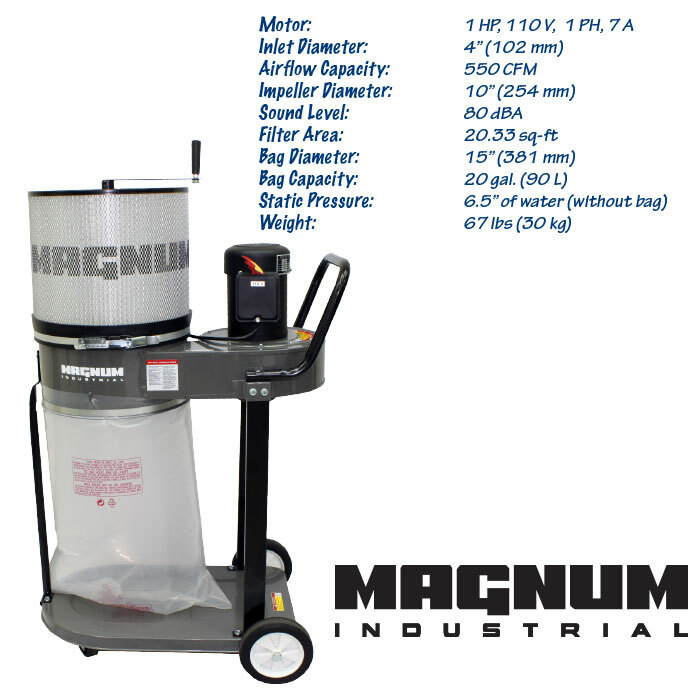 Small, mobile dust collectors, like this Magnum Industrial MI-11100, can provide excellent dust control for smaller shops with one or two pieces of machinery. The first step is determining the CFM requirements of each machine in your shop. This chart, courtesy of Oneida Air Systems, shows the typical CFM demands for common woodworking machines. The next step is finding the best place for your collector. If possible, find a location that doesn’t disrupt your workflow. From there plan the ductwork to each workstation and then go out and buy a collector that meets your shop’s requirements. Your collector needs to provide enough CFM for each machine running in your shop. So if you plan to operate two machines simultaneously, your collector must be able to haul in debris from both machines. For example, if you have a table saw that demands 450 CFM and a planer that needs 800 CFM, your collector will need to handle at least 1,250 CFM. Your collector’s performance is also affected by the diameter and length of your ductwork, factors that play a significant role in the overall effectiveness of your system. Dust collection systems need to balance air volume (measured in cubic feet per minute or CFM) and velocity (feet per minute or FPM) and limit static pressure (SP). The air travelling through the ducts must maintain enough velocity to keep the dust and chips in the airstream—that’s 4,000 FPM in the branches and 3,500 FPM in the main line. If velocity diminishes, the debris will fall out of the airstream and build up inside the ducts. Decreasing duct size improves velocity but also increases friction, or static pressure (SP), which affects the volume (CFM) of air being moved. Systems that move less CFM collect less dust. Try to take a direct route to each machine, avoid tees and hard 90 degree elbows, and limit curves, bends and flex hoses. Each shop poses unique challenges—there is no cookie-cutter solution. You should build a system that works for your shop and budget. If you’re looking for more information about why duct size matters, check out this helpful tutorial from Oneida. You can also pick up a copy of Dust Collection Basics. It has a handy table to help you calculate the right balance between volume (CFM) and velocity (FPM) for your shop. Some folks like to use sheet-metal ductwork, while others prefer PVC pipe. If you plan to use the latter, consider grounding your system. Wood and dust particles create static electricity, and because plastic pipes aren’t conductive, a static charge can accumulate and release with sometimes shocking results. To connect each machine to the main duct, consider using clear plastic hose, which we offer in both 4″ and 6″ diameters. This hose lets you easily spot clogs and is wire-reinforced, which helps ground your system. Whether you use metal or PVC, connect your ductwork with screws so you can access individual sections for down-the-road maintenance. Seal the connections with foil tape or duct sealant and make sure there are no leaks. 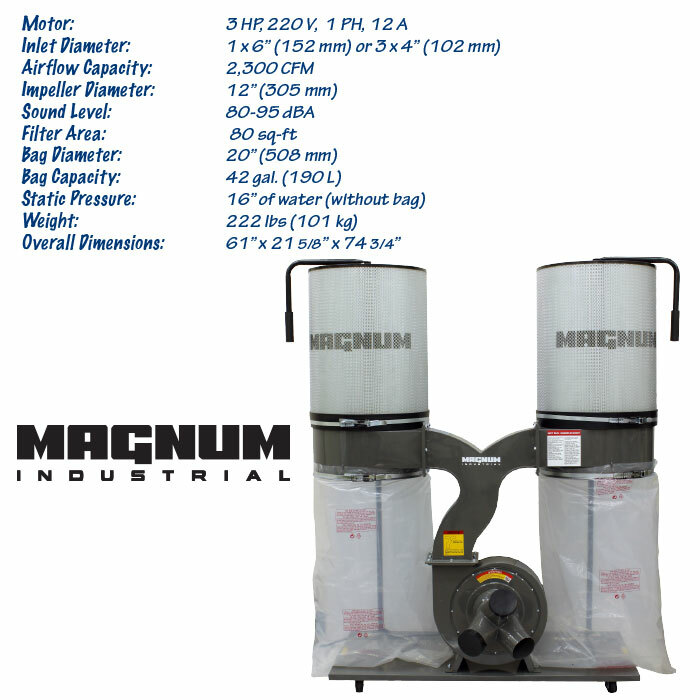 A bag-style dust collector is a popular and affordable way to keep your shop clean and safe. Adding a canister will improve filtration, plus they last longer and are easier to clean than filter bags. Cyclone pre-filters, like this 10-gallon Dust Deputy, remove larger wood chips and chunks before they reach the impeller. By separating large debris before the impeller, cyclone dust collectors are more efficient than traditional bag-style collectors. An overhead two-stage filter can remove fine dust particles that linger in the air. 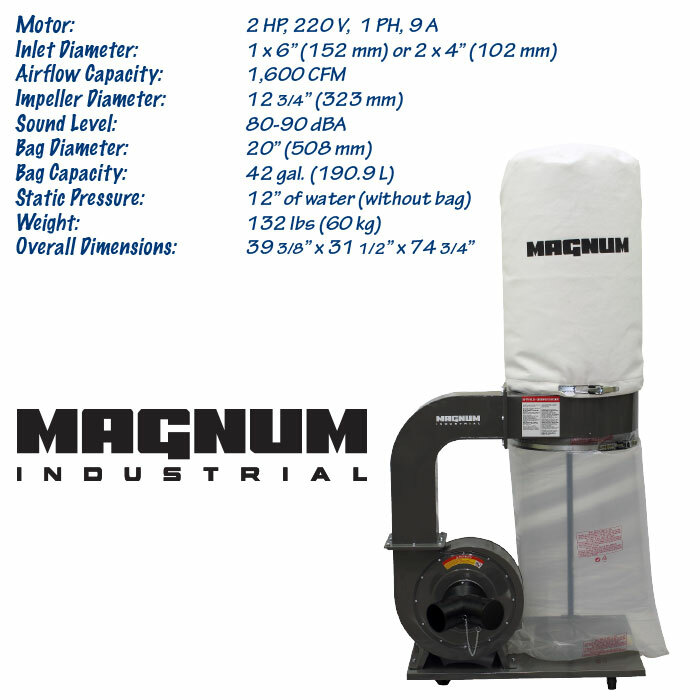 Most bag-style dust collectors come equipped with a top filter bag rated between 35 and 1 micron(s). Because fine dust particles are often the most harmful to our lungs, it’s important to check the micron rating before you buy your collector. It’s also not a bad idea to wear a respirator—especially if your machine has a more porous filter, i.e, anything above 10 microns. Also wear a respirator whenever you empty the bag or canister. After awhile, a layer of fine dust will cake the inside of your filter bag. This dust, or “cake,” will affect the performance of your system: The right amount of cake works like an additional filter, removing fine dust particles before they reach the filter bag. Too much cake, however, will restrict the airflow. Keep an eye on the build up, and regularly clean out your filter bag. 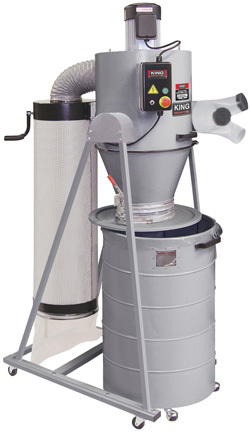 If you want to upgrade your existing dust collector with a better filter, KMS sells optional filter bags and canister filters. Remember that canisters and bags with high micron ratings will reduce a collector’s CFM performance, an important consideration for those upgrading an older collector with improved filter media. Another cost-effective upgrade–especially for smaller shops–is a cyclone pre-filter or Dust Deputy, which removes larger chunks and chips before they reach the collector. The benefit is twofold: fewer bag changes and better performance. 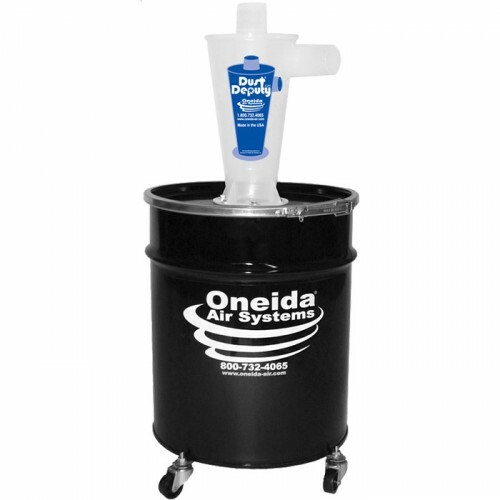 Oneida’s Dust Deputy features design elements similar to those found in two-stage cyclone dust collectors, which are some of the most powerful and efficient dust collectors available. While bag-style machines draw everything through the impeller, cyclones separate the larger pieces from the fine particles, allowing them to use impellers that are designed to efficiently pull fine dust particles. If you’re looking for a cyclone dust collector, please drop us a line. KMS can special order cyclone collectors from a variety of manufacturers. Adding a remote control or an automated switch can improve your workflow, especially in a larger shop. But these upgrades are more than just time-savers. With a remote control, you are more likely to turn on the dust collection system, even when you are making only a few cuts. This means less dust in your lungs. With automated switches, your dust collector will activate whenever you use a connected tool. And after you power down your tool, the switch keeps the dust collector running for several seconds to remove residual dust from the air and your ductwork. Whether your shop is large or small, proper dust collection will make it safer and cleaner, and while it might take time to plan and build an effective system, your shop is worth it—and so is your health. If you have any questions about dust collectors and accessories, give us a call, send us an email or stop by one of our nine locations. 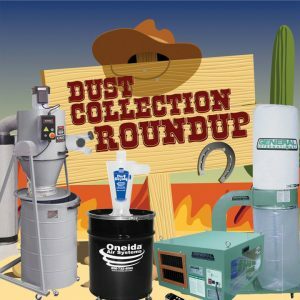 We’d love to help you find the best dust collection solution for your shop. 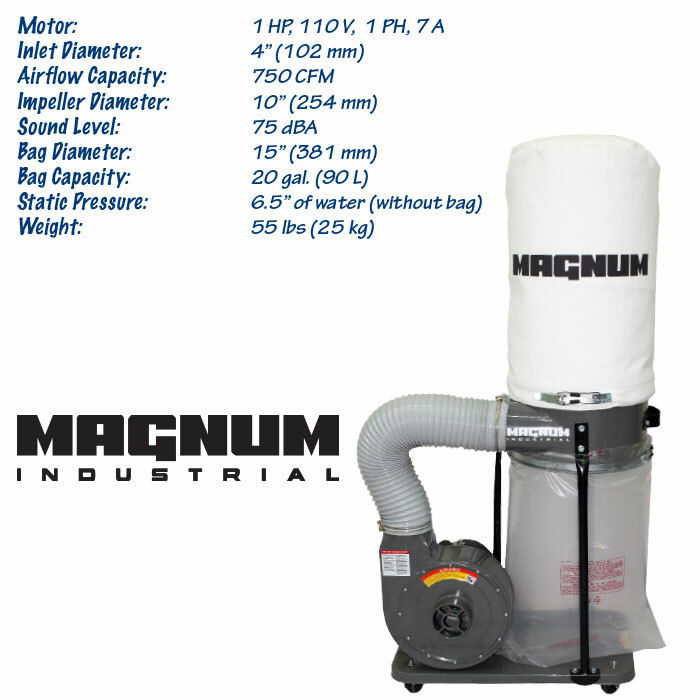 Check out our line of Magnum Industrial dust collectors in the slideshow below! This entry was posted in Archives, Woodworking and tagged air filter, air filtration, cyclone, dust collection, dust collector, dust deputy, magnum industrial, Woodworking, woodworking shop by Your Friends in the Tool Business. Bookmark the permalink. Purchased an MI-11200 last week and it’s doing great with the 6 in jointer and planer six hours a day for 2 days. I’m thrilled with it. It’s plumbed in with 4 in galvanized piping. And the dust is little to none which thrilled the wife. I feel it is a good purchase. I would like to equip my shop with a good dust collection system. What equipment is recommended? Shop is 24′ x 29′ x 9′ ceiling. One machine in use at a time. 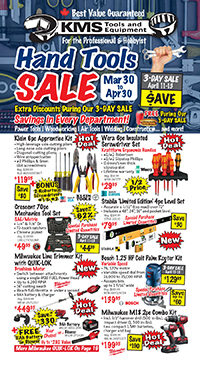 Larger tools include: Large lathe, Band saw, table saw, planer, belt sanders. Planers and belt sanders can produce a lot of dust and debris, so you should consider a 1.5 hp dust collector capable of moving 800 – 1,000 cfm or more. 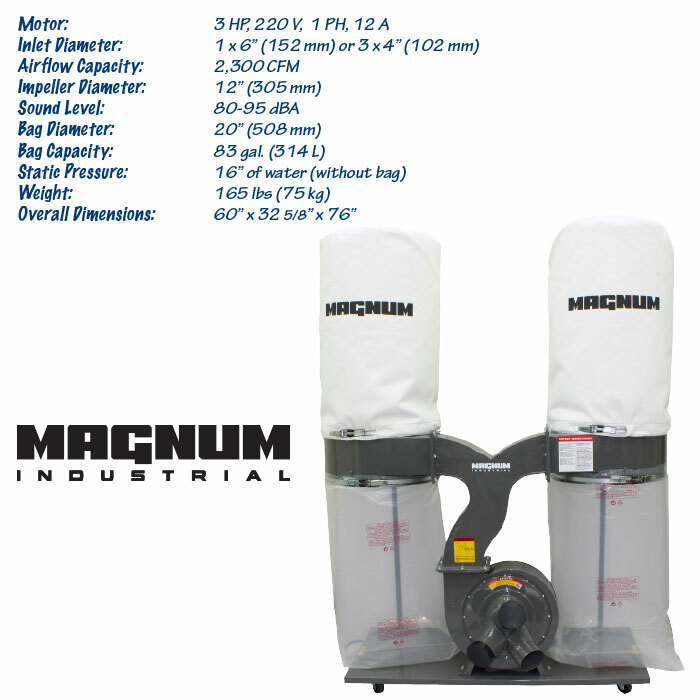 The Magnum Industrial MI-11200 delivers decent air flow for its price and also has casters, so you can position it near each machine as you use it. 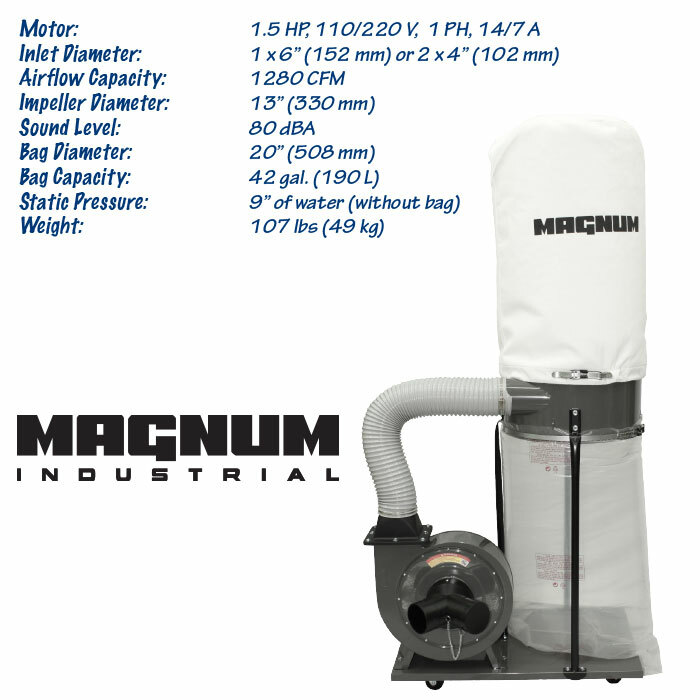 If you want to plumb your dust collector into your shop, a 1.5 HP machine might work. But it also might not. The lengths and diameters of the ducts you install affect your dust collector’s performance, so the specific layout of your shop plays a huge role in determining the right dust collector. Check out this tutorial for more advice on planning a built-in dust collection system. Some really important points are mentioned here. A lot more than thanks for sharing it. Would an MI-11250 benefit from an inline cyclone before the motor ? Thank you for your question. 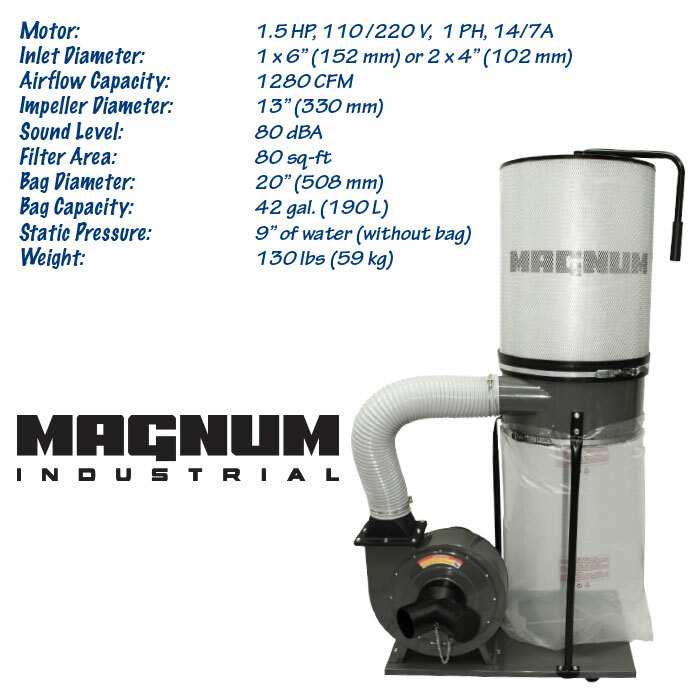 The MI-11250 would benefit from a cyclone pre-filter, as would any dust collector 3 HP or smaller. We recommend Oneida’s Super Dust Deputy.